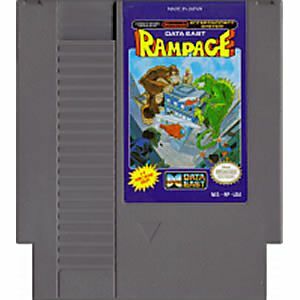 Rampage original NES Nintendo Game cartridge only - Cleaned Tested and Guaranteed to Work! The game worked perfect and the label was in excellent condition. I am very impressed with Lukie Games. This was my first purchase and the game came much sooner than expected, and was in perfect condition. The game itself worked on the first attempt, no need for the blow technique or the qtip rubbing alcohol trick. I was very impressed and will be purchasing from Lukie again in the future. Lukie has become my one stop online shop for classic games and refurbished systems. I've been disappointed at the results of other game sites, but Lukie delivers quality every time. Truly a classic game. Can't believe I got it for such a great price from Lukie and in wonderful condition. Definitely gonna be ordering more from Lukie! As for the game, it's a tad repetitive. Destroy buildings. Yup. But hey, it brings back the memories. this is not like the game I played in the arcade in the late 80. George the ape looks so weird and when you complete the level lizzy the lizard bangs on the map of the usa and the screen flashes wildly. And where is the third monster in this game the wolf. The music could be any more annoying, repeating all the time, I had to put the mute button on so I would not go crazy. 100% radical! What else can I say about this game? It's by far one of my favorite games ever! 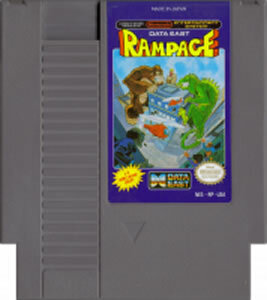 There is not much to this game, destroy buildings while helicopters and people try to shoot you down.You can choose from two different characters "George" who is an ape or "Lizzy" who is a green Lizard. It's a classic game. If you like to climb buildings and destroy them then you'll like this game. Good ole monsters stomping on buildings and eating it's occupants, umm yes good game. 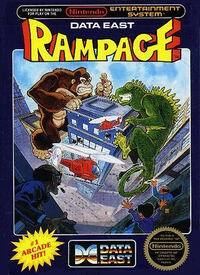 This game is a port of the 1986 Arcade game Rampage, a game where you essentially destroy buildings. This is a fun game to play both alone or with a friend as you destroy skyscrapers and crush tanks living out every giant monster fantasy you could think of. This is a great classic game where its simplicity makes it incredibly fun. I highly recommend it.